Rains scored for the second straight day in Nilgiris as Coonoor recorded 81 mm rains till 4:30 AM continuing its 115 mm rains on Tuesday. Yesterday also saw a few places like Kotagiri, Pilloor Dam, Perumbahallah record heavy rains with Perumbahallah recording more than 20 cms rains for the 24 hours ending 8:30 AM, 15th March 2017. 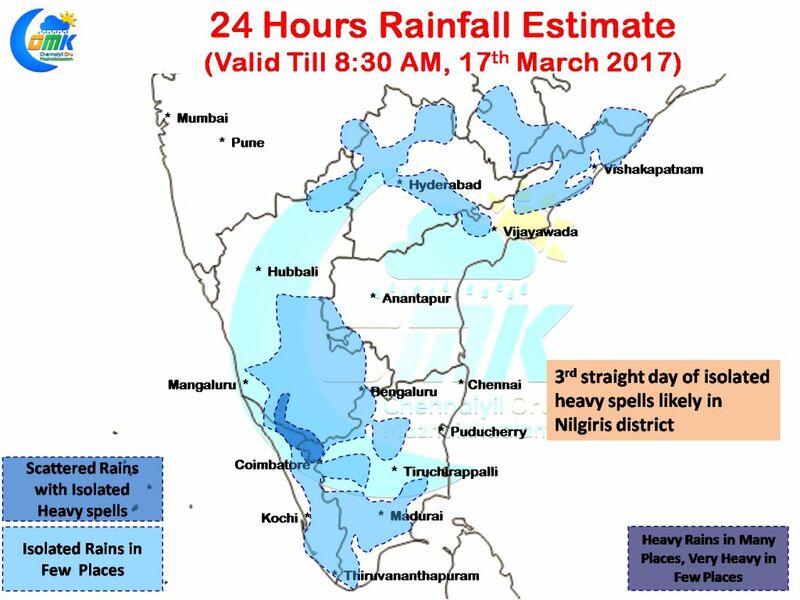 Its a confirmation of the rain bands moving west that Nilgiris district particularly along the Eastern Slopes starts getting heavy rains. In all probability we are likely to see places like Coonoor score a hatrick of heavy rainfall day as today also is likely to see some heavy rains at a one or two places along with adjoining parts of Kerala & Karnataka. These spell of rains are surely going to go a long way in mitigating the severe drinking water crisis Coonoor was facing over the last few months. Rains are likely to stay closer to the West Coast of Peninsular India with mostly dry weather to prevail in large parts of Tamil Nadu particularly in North TN region. Coastal areas could see isolated spells of light to moderate rains south of Nagappattinam while one or two places in Dindigul, Theni, Tirunelveli & Madurai districts along the western ghats could see isolated heavy spells of rains. Rains are expected to ease in about 48 hours after which only extremely isolated rains are likely over major parts of Peninsular India with summer getting set for a comeback.